Currently accepting applications for the following semesters: Summer 2019 (deadline March 1), Fall 2019 (deadline April 1), and Spring 2020 (deadline Nov. 1). Senior Mathematics majors celebrate the completion of senior thesis work in the Polynomial Method Seminar. The Ross Mathematics Program is hiring undergraduate math majors and math graduate students to work as Ross Counselors next summer. For further information about Ross Counselor jobs, visit https://rossprogram.org/counselors/. 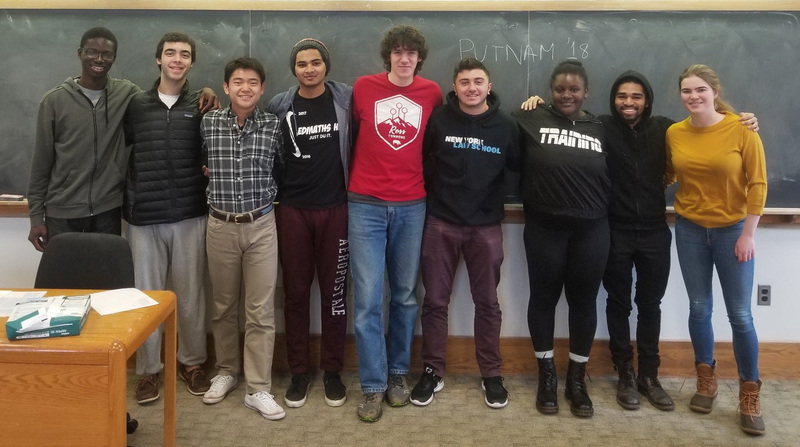 Nine students took part in the 79thAnnual William Lowell Putnam Mathematical Competition this past Saturday, December 1, 2018. III. Senior work: A 0700-level MATH seminar in the senior year. Students interested in advanced work in applied mathematics may wish to include a post-calculus sequence of courses in their area of specialization. Examples are MATH 310 & 311, MATH 310 & 410. A list of current options is maintained on the department web page. The second course in these specifically designated sequences may be counted in place of MATH 302 for the major. Note: Students are strongly encouraged to include a proof-based course such as MATH 0241 or MATH 0247 early in their programs. This is especially helpful prior to taking MATH 0302 or MATH 0323. Students planning a "3-2" engineering program who wish to major in Mathematics should complete the 700-level senior seminar in their sixth semester at Middlebury. Honors: Students who wish to be considered for departmental honors in mathematics must take one additional elective (12 courses total). Honors designations are based on senior work and GPA within the major. Required for the Minor in Mathematics (six courses total at least half of which must be taken at Middlebury College in Vermont): MATH 0121, MATH 0122, MATH 0200, and three courses at the 0200-level or above. Joint Majors: The Department of Mathematics does not offer a joint major. Advanced Placement: Advanced placement in the department is offered to first-year students whose secondary training indicates they can commonly bypass one or more of the beginning courses in mathematics. Majors typically begin their study of mathematics in MATH 0122 or MATH 0200. Mathematics majors who need to begin the study of calculus with MATH 0121 may arrange with their advisors to use this course as one of the required electives. Credits for MATH 0121 and 0122 may be earned through the College Board AP exams or international exams such as the A-Levels or IB. At the discretion of the chair, additional courses may be waived in recognition of exceptional secondary school preparation. However, in all cases the major must include at least 7 Middlebury College or approved transfer courses, and the minor must include at least 4. Students who have earned grades on advanced placement calculus exams that are eligible for credit may not register for the equivalent course at Middlebury College. Thus students who have earned 4 or 5 on the Calculus AB exam or a 3 on the Calculus BC exam may not register for MATH 0121, students who have earned 4 or 5 on the Calculus BC exam may not register for MATH 0121 or MATH 0122. This policy applies irrespective of whether students choose to use their AP credits toward meeting Middlebury's graduation requirements. The following international credentials carry the same credit as a 4 or 5 on the Calculus BC Exam: A-level exam with a mathematics grade of A, B, or C; or IB Higher Level Mathematics with a grade of 6 or 7. Other Credits: Because of the wide variation in course offerings at other institutions, students wishing to substitute a course from another college for any course in mathematics must seek approval from the department before registering for the course. IV. Senior work: A 0700-level MATH seminar in the senior year. Note: Students should consult the mathematics department for examples of course sequences in the mathematical sciences option recommended for emphases in Mathematical Economics, Computer Science, or Physical Sciences/Engineering. For students completing double majors, electives used towards a major in another department cannot also be counted as electives in the mathematical sciences option.